It’s always a challenging task expressing how much you love something, especially when it comes to a film that has touched your soul in a deep and meaningful way. When a terrible movie crosses your path, it’s a joyous, simple job to tear it down, to throw slanderous hyperboles at it, to mock it mercilessly. But when something so pure, so beautiful, and so deeply affecting comes about, it’s hard not to be overwhelmed by the sheer torrent of feelings that silences you into a state of awe and admiration. La La Land does just that. It will stun you with its beauty and have you weeping from its fantastical realism. Looking at its trailers and poster, it would be all-too natural to assume that Damien Chazelle’s modern musical is yet another cheesy attempt at bringing back the golden age of cinema. We’ve seen examples of modern musicals fail to capture the glamour and class of the Fred and Ginger era, and it would be easy to think that La La Land is yet another disappointing venture into a nostalgia that has all but disappeared, or arguably, ever existed. What Chazelle has managed to deliver, however, is a glorious nod to the Hollywood musical in an utterly bittersweet and crucially un-Hollywood fashion. At its core, the film’s premise is simple: boy meets girl, they fall in love, they encounter realities in the face of their romantic dreams. Unlike other romance films, this one is, of course, spliced with toe-tapping song and dance extravaganzas and tear-jerking lullabies, all thanks to the musical mastery of composer Justin Hurwitz and choreographer Mandy Moore. Emma Stone and Ryan Gosling play our leading lovers, and although they’re no Fred and Ginger, their on-screen chemistry and respective natural charisma are pure joy to watch on screen. Ryan Gosling plays Sebastian, a taciturn jazz fanatic who dreams of one day opening his own jazz club while Emma Stone is Mia, an aspiring actress working in the Warner Bros. lot coffee shop, desperately trying to juggle her menial job with film and TV auditions. After several chance encounters, a romance is sparked between the two L.A. dreamers until, that is, their career aspirations get in the way. Chazelle is said to have wanted “to make a movie that would embrace the magic of musicals but root it in the rhythms and texture of real life.” La La Land does just so by nodding both to the studio-era MGM musicals while also anchoring its aesthetic in the 60s French New Wave – think Singin’ in the Rain meets The Umbrellas of Cherbourg. This melange of cinematic heritages has for effect a spectacular riot of colour and euphoria that is contagious from the very first scene, an extravagant musical number that bursts forth from an L.A. traffic jam. During these barrages of colourful energy, it’s hard not to smile and even the most cynical viewers will be won over by the infectious zest and zeal of the dancers on screen. What saves La La Land from being too saccharine and ultimately too Hollywood, is the relatability of the two protagonists’ characters. The tensions of trying to pursue one’s own life goals and dreams while also trying to maintain a relationship and show support for your partner is something that many of us can surely see reflected in our own lives. Seb and Mia are two twenty-somethings trying to balance their own necessary selfishness with their love for one another. When it boils down to it, is it possible to have everything? Can love and success both be achieved in equal measure? 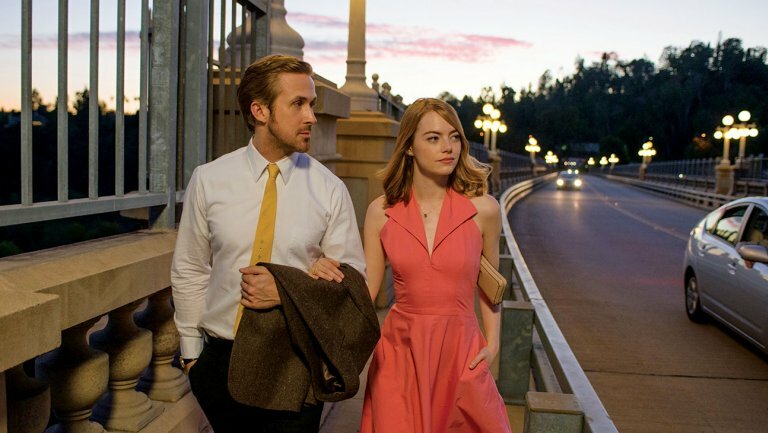 These questions are the backdrop on which Emma Stone and Ryan Gosling glide and tap away, and thanks to their scintillating chemistry, any make-believe-ness the musical genre usually carries with it is elevated to the higher plains of beautiful realism. La La Land has already been stirring up quite a lot of attention for itself this award season, and has already managed to win a record-breaking seven Golden Globe nominations as well as eleven BAFTA nominations. The film’s infectiousness is spreading like wild fire, and it is rumoured to be a favourite at this year’s Oscars. If you haven’t already seen this incredibly wonderful film, do yourself a favour and beat the January blues with this stunning musical extravaganza. This one is definitely worth making a song and dance about.